This post has won the H.U.M. contest conducted by the Blogger's Park Magazine (World's first blogazine) at scratchmysoul.com under the category "THE NEW INDIAN CURRENCY - CANDY"
Last month, when I was travelling from Indore to Bhopal and as my cab crossed the first toll booth on the highway, the cabbie handed me a ten rupees note and 3 eclairs (Cadbury was not written on those fake éclairs). As i was doing a post mortem of those counterfeit eclairs, which is my habit, the driver adviced not to gulp them as the same could be handed over at the very next toll booth. I resisted the temptation and utilized those eclairs. This cycle continued until we crossed all the four toll booths. The éclairs received at one toll booth were readily acceptable at the other in place of coins. I had been receiving such chocolates instead of coins at the provision stores, but never knew that the same would be even acceptable to them. Even swanky hyper markets spread over thousands of square feet, have a separate box at their cash counters for these 1 rupee candies along with the coins. Welcome to a country where candy is replacing coins. This, “a candy for a coin” trend reminds me of a lesson from my school days where I was taught the concept of barter system. Certain commodities where assigned a specific value and were traded in exchange of certain other commodities : Goats for a sack of rice, horses for a sack of wheat. Due to the difficulties faced in carrying and valuing the goats and the horses, metallic coins were introduced even before Christ was born. Some wise man said that history repeats itself, and now because of the shortage of metallic coins, we have found a new substitute for it in the form of candy. Looking at the ease at which these candies are getting acceptable at all places, I wonder if the RBI or the Government of India is having some secret plans to introduce an official 1 rupee chocolate candy promising to provide the bearer a sum equivalent to rupee one. Who knows, it can even introduce 10 rupees official chocolate bars in place of currency notes. In case the chocolate bar is ina melted state, it may be treated at par with a soiled note. Welcome to a country where currency is wrapped up in a shining wrapper. Jokes apart, this phenomenon of giving “a candy for a coin” is not as simple as it prima facie appears to be. Its roots are deeper than they appear. The prices of steel, which is the raw material for coins in India, have been zooming northwards for quite some time now. As a result of which, the intrinsic value of an Indian coin far exceeds the legal or face value of such coin. The coins which are in circulation in the market are being collected from the market at a premium, melted and then supplied for manufacturing razor blades and other petty steel articles. It has actually become a lucrative business in some parts of the country. This has lead to a shortage of coins in the Indian market. But a person’s bane may be another person’s boon. Shortage of coins has led to the flooding of markets with 1 rupee candies, which the shopkeepers are using instead of coins. I am sure that one day some political party will take this issue to the Parliament that blah blah MNC is sucking the Indian coins to boost the sales of its candies. Candy, the new Indian currency comes with unique features, thus covering up the shortcomings of the metallic Indian coins. Its intrinsic value is far less than its face value. A candy, worth a few paisas is actually worth a rupee in the market. Buying it at a premium and melting it would be of no use as it would again remain a candy only, though in a different shape. In case you feel hungry and even if u have a coin, you cannot eat it. But this new currency can immediately satisfy your hunger. Welcome to a country where cocoa is replacing metal. The factors of Demand and Supply drive an economy. From cows to coins and then from coins to candies, these factors will keep evolving the exchange system. Paying the toll tax made me realize that its not only the state of highways which is changing in India, but also its currency. 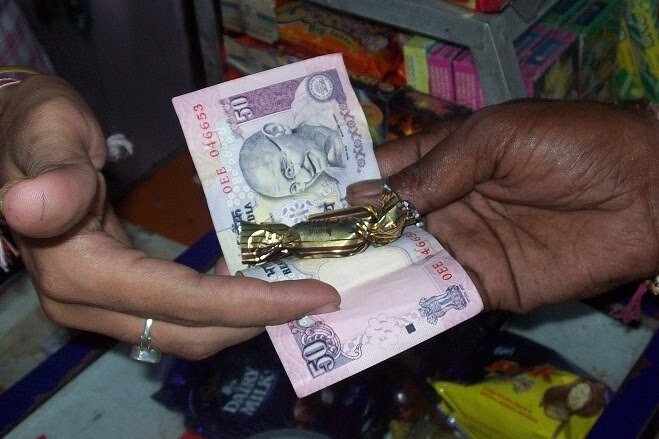 Candy has become India’s new legal tender, its new currency. Please feel free to leave your comment on this article. 50 Respones to "Welcome to a country where candies are replacing coins"
Thanks for your feedback Mr. Balaaji.. welcome to MONEY MATTERS.
. . . leaving us with no choice but to accept chocolates. . Very true, we have not choice but to accept chocolates or forget the change..
. . . better enjoy the chocolate than to leave empty handed. . But, do you realise that the toll-booth operator or the hyper-market gets those candies for less than a rupee? Since they buy in bulk, they would be getting atleast 10-15 paise rebate. And if they give away 3000 candies a day instead of actual change, they are raking a profit of Rs. 300-450 (atleast) per day. That turns out to anywhere between 9000-14000 per month. Now, you can do the math yourself and see who is losing! Very true Mr. Vinay. It was an attempt by me to deal with this phenomenon in a sarcastic way. I raised the same point in my article also that the intrinsic value of a candy ( i.e. the cost price here) is far less than the intrinsic value of a rupee coin, so definitely the person giving it is at an advantageous position. But for the receiver the price of a candy as well as a coin remains the same. It is for this reason only that some shopkeepers will never accept the candies even though they themselves are giving it in place of coins. That was a post on economics that even aam janta like me can understand! It was put in a funny vein to make it more enjoyable! Thanks for promoting my post. Do visit the blog too! Welcome to MONEY MATTERS zephyr and thanks for ur appreciation. Thanks a lot Arjun for your appreciation. Hope you find the contents of MONEY MATTERS interesting and useful. It was fun reading it. Really enjoyable. good write up... keep it up.. Excellent post. Liked so much. Great Post. Its not only steel or metal that is being replaced by these candies. The 1 Rupee notes have long vanished. It has been years since I have seen one. Seems the printing cost on the paper is far more then its face value. @ Juzer Noorani : Thanks a lot for your valuable feedback. You have very rightly pointed out that 1 rupee note is history now. The main reason behind it is that a rupee note, being made of paper, has a very short life and being a note of a less value, it keeps changing hands very often, thus further reducing its life and making its circulation and maintenance a costly affair. @ Vanathi : Welcome to Money Matters and thanks for your feedback. Who knows, candies may get replaced by cucumbers. . !!!!! Good One Nandan!! And ya..Thanks for accepting the awards. @ Zainab : Thanks and thanks. First one for your feedback and second one for those lovely awards. Thanks for telling us the real reason behind the disappearance of metallic coins. Candy manufacturers will come out with cheaper (low quality, non edible, look alike almost plastic in content, candies - after they are just to be swapped again! Same guys who collect metallic coins for sale to razor blade manufacturers will also trade in Nakli candies! I also have come across this very new barter system of a candy against a rupee. Initially I was happy for it till i discovered the candy to be 'nakli'. Now waiting for the day, as per u when candies become India's new legal currency. I did not know about this at all, thanks for the knowledge ! Also, very well presented. @ Iti : welcome to MONEY MATTERS and thanks a lot for your valuable feedback. @ Sandeep : Welcome to MONEY MATTERS. All the very best for all your blogging endeavors. Hope to see you here again. I believe if you are accepting 1 rupee eclair, than you are discount 30 np dealer margin, if it is duplicate that it is 50np...I believe this barter system was introduced when acute shortage was prevalent. People started making premium by selling coins, now each establishment would do good to give a voucher I OWE YOU or credit notes for the change or credit it into your loyalty cards. Hahaha, really nice observation, Nandan.